This morning I turned MuseumofFun.org into WhitstableFunPalace.co.uk. It’s only a name change, but it made me feel nostalgic. I’ve made so many friends and enjoyed so many good times with MoF over the years. MoF is the short form of Museum of Fun and it’s quite handy that it’s easily adapted to a profane phrase in the stressful weeks leading up to any event. In July 2014 I heard of Fun Palaces, and started the project with one potential helper, a hopeful tweet, and a page at meetup.com. I called Whitstable’s Fun Palace, ‘Museum of Fun’ even though it would have been far more sensible to call it Whitstable Fun Palace. Sensible is not a concept that has much to do with any of this. I decided no one knew what a Fun Palace was, and the event wouldn’t happen in a palace anyway. I wanted to find a venue then fill it with random fun stuff that people could visit and enjoy. Museum’s are venues filled with random fun stuff for people to visit and enjoy. But basically I just liked the sound of Museum of Fun. ‘Why not?’ is the usual reason for anything to do with Fun Palaces. I was also exploring what fun might mean. Museums are all about learning, and this was my own ‘museum’ to learn about fun. I had plenty of questions to think about. Why is ‘fun’ only for children? Why is ‘adult fun’ not innocent fun at all? If children learn through play then when does that sort of learning stop? Can grown-ups learn through play too? My Museum of Fun project didn’t actually answer any of my questions, but I liked thinking about them anyway. I even tried to come up with a definition of fun. It’s possibly something to do with mixing pleasure with surprise. I won’t bore you with my workings out! I felt so much fondness for my old project as I said goodbye to the name. Our MoF Fun Palace was always a bit of a rebel, and it’s right that we should support the Fun Palaces brand. Plus the format of the event is different this year and the new name suits the change. So here we go with Whitstable Fun Palace 2017. I looked at old photos this morning and considered my Museum of Fun good times. Here’s my 22 favourite Museum of Fun things in no particular order. It’s 22 just for fun. It wasn’t just a Pot Noodle, but we took suggestions from Twitter followers and Pot Noodle was my favourite. The audience watching our Pot Noodle science experiment. 2. Creating a Whitstable smell map. We set challenges to use a limited number of bricks to create something. It was 10 bricks the first time, we were a bit more generous and gave 15 bricks the next year. Lots of people helped with this project, though the MoF comittee did end up making a lot of buildings. Also the committee’s husbands. Thank you Adam for the harbour, and Steve for Whitstable Town Football Club. 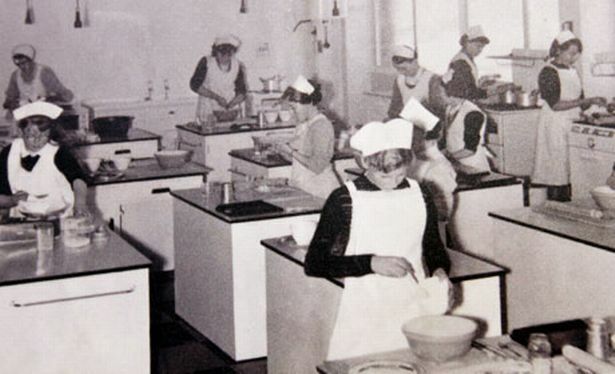 St.Aphege’s school was made by the pupils. Several shop keepers made their own shops. The Offy lost their cardboard shop down the back of a drinks display fitting. But here it is before the accident. Here’s our MoF venue, Whitstable Umbrella Centre, and of course the cardboard version. This was Amy Turner’s inspired idea. We had timed races around the cardboard town. Once again the poor husband’s got roped in, thanks for the Scalextric Phil! Here’s Whitstable’s famous aggregates factory. Thanks to Arthur’s dad for Whitstable castle. 6. Whitstable ‘sea’ and junk boats. Fun can be as simple as water, polystyrene, paper and sellotape. I didn’t know he was coming. This was part of our ‘Drink & Draw’ fundraising night. I can’t remember why it was a time machine. We had a few fabric craft things, but giant knitting needles and patient knitting teachers worked well. 10. Cute vs ugly experiments with bubble wrap. Another idea to file under ‘why not?’ Do you pop bubble wrap more aggressively when looking at an ugly teddy? It’s science, honestly! We made this two years in a row, even though it took ages to build. I love follies. It was my cardboard folly. You could go inside it. It was made of boxes. Perfect. We were very lucky to have Gemma from Pfizer and science outreach people from the University of Kent creating experiments in 2015. Not sure what this experiment was. I think this was the coke and mento rockets. We had forensic science with our pretend police officer. In 2014 we had no science people involved, but I used Google, red cabbage and bicarb to make lots of experiments. We quite literally got egg on our faces when a drunk chap smashed up our ‘it won’t break’ egg experiment. Some home made musical instruments. Amy from Honker Tonkers worked so hard to make this. The whole thing was put together with borrowed stuff. This was one of our fundraising events, though Fun Palaces are usually free. We gave some free tickets to children from the local neighbourhood centre too. One of my favourite Fun Palaces things was involving children who don’t usually go to organised events. 15. The Amy Cuddy confidence experiment. A body language experiment. Most people said they felt more confident when they did the ‘power pose.’ We had a chart but I can’t remember the exact percentage. 16. Poetry Postboxes in town. More people wrote poems in the chippy than in the library. We did try to get Greg wallace to judge, as he lives here. No luck. The local bread maker judged the winners and there were some very exciting sandwiches. 18. Random world record attempts. The sock sorting proved most popular. No records were actually broken on the day, but it was worth a try. 18. The ‘What is fun?’ table. This ‘exhibit’ didn’t really work, but children enjoyed the old toy record player. Awful jokes, but all the better for the groans. 20. The clubs, organisations and businesses that got involved. The party supply lady let us borrow her talking parrot. The local snail farm came along. The Twin Town Association made geography games. The University of Kent events management students turned up with ice cream making, hook-a-duck, and plenty more. Shoe box art. They put the boxes on a tricycle. Yes, really. I can’t remember this memory craft. Hmm. Tina uses eye movement art software with disabled children. It was really interesting to see how it works. Some of the art created with the eye movement software. Vattenfall run the local wind farm. They sponsored MoF, and showed off a wind machine. Sue from WhitWord ran a mystery book swap. There’s no room to list everything but there are plenty more pictures on the website. The ‘real’ Whitstable Museum helped us expand our space in 2015, and they created a small but enjoyable Museum of Fun last year because our regulars needed a year off. It was good to see a historical theme to the fun. I once totted it up and realised more than 100 local people have given time to help MoF over the years, there were around 70 volunteers involved in 2015. I haven’t space to list all the brilliant people who’ve been involved, but I’m lucky to have made so many good friends through MoF. Catriona Campbell deserves a special mention. She was the first person to respond to my tweet in 2014. We’d never even met, but I’m so glad she came to that first meeting. She’s leading this year’s project and it’s going to be super. Amy Turner was my crazy and creative co-lead in 2015, and I miss her now she’s moved out of town. Peter Banbury of Whitstable Museum has been particularly supportive, and he kept MoF going when we needed a year off. Gemma Scotney is also a special helper who’s always sizzling with science ideas. She’s made me enthusiastic about the periodic table already. The whole town will be hunting elements in October. If Museum of Fun looks like a random collection of people putting on a random variety of entertainment under a vague banner of ‘fun,’ well that’s pretty much it. This year the name will be different, but the spirit will be the same. If you want to get involved please do get in touch. Write a list of ideas for things you might like to create that people might enjoy. Write ‘why not?’ next to each item. Find the stuff and people to make each thing on the list happen. Obviously there is no one ‘right way’ to do this, and that’s part of the reason Fun Palaces are brilliant. My favourite Fun Palace (apart from MoF, obviously) was one in a butchers shop. The shoppers simply had a chance to sketch meat. Visit Funpalaces.co.uk to find out more about this mad thing. Whitstable Fun Palace is a new name and a new start. I haven’t quite pinned down the definition of fun, so I’m glad I’ll have opportunity to explore it a little more on October 8th. I hope you will too. I’ve followed Peter Hitchens’ pro-grammar school arguments for some time. He has a favourite phrase he uses when he attempts to explain the low proportion of disadvantaged pupils in selective schools. He says the current selective schools are a “tiny rump of besieged grammars” and claims that they are quite unlike a national grammar system. This week in a Mail on Sunday article he trotted out this point again. The article says the only reason grammar schools are monopolized by the wealthy is because they are full of ‘well-off long distance commuters’. I expected him to retire this point based on new evidence, because in October in a Radio Kent debate he tried the argument and was told that every child who passes the 11-plus in Kent gets a grammar school place. That’s not ‘besiged.’ Kent is the largest selective county, and wealthy commuters are not stealing places from poor Kent children. Many of our Kent grammar schools are not even oversubscribed, they don’t find enough children who pass the 11-plus and fill with appeals. There are 5,100 grammar school places, and each year these places are allocated to the 28% of year 6 pupils defined as ‘grammar school standard’ by our local 11-plus test. Around 300 places are filled by out of county pupils (with just over 100 Kent pupils also travelling over the border to grammars) but this small number of places is not enough to change the balance of our grammar schools. Just 2.8% of pupils attending Kent grammar schools are eligible for Free School Meals, compared to 13.4% in the county’s non-selective secondary schools. So here in Kent we have a fully operational selective system in a large county. This ought to be the selective system of Peter Hitchens’ dreams, yet he doesn’t claim it as a success story. He seems to think that Kent is all commuter belt with the wealthy taking the grammar places. Yet Kent has many disadvantaged towns. It seems he doesn’t know about places such as Dover, Folkestone, Margate, Gillingham, Chatham, or the Isle of Sheppey. The grammar schools in these communities are not educating significantly higher proportions of disadvantaged pupils. My scribbled attempt at explaining Kent. It seems that whenever you select the 28% of most able school pupils you will find enough middle class and wealthy pupils to make up that quota. Kent is certainly wealthier than some counties, but if grammar schools don’t work in a place with a varied mix of communities like Kent, then they should not be placed in any county with a similar profile. That pretty much rules out the south of England. Peter Hitchens’ argument is based on grammar schools educating the working class in their heyday, but in the 60s we had a large working class and a small middle class. Now we have a huge middle class and a small working class. If there are 55% middle class families in Kent trying to squeeze into just under 30% of grammar school places, of course this will lead to intensive tutoring and few places left for disadvantaged families. Wealthy, well-educated, parents will claim the grammar school places, while working class families will have less money for tutors, and probably less time to home-tutor the skills of non verbal reasoning. So the reason Kent grammar schools have low numbers of disadvantaged pupils is nothing to do with admission to the schools (based on test pass and local catchment) it’s because so few disadvantaged pupils actually pass the Kent Test. We know most disadvantaged children lag behind their peers at maths and english (this is part of the test) and tutoring and parental aspiration also play a large part in grammar entry. Peter Hitchens insists that if there was a national selective system selecting 30% of pupils the system would work. But if this happened overnight not a thing would change in Kent. The grammars in Kent would still educate mostly kids from wealthy backgrounds. 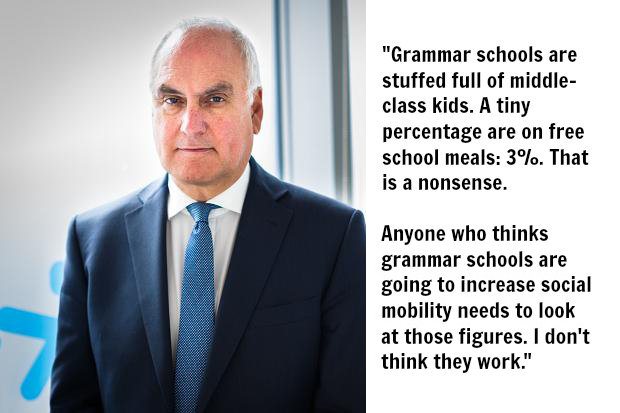 So you either have to significantly lower scores to get poorer children into selective schools, or you have to accept that grammar schools will be “stuffed full of middle class kids” as Sir.Michael Wilshaw put it. I know Peter Hitchens prefers selection by ‘mutual consent’ between parents and teachers. Our council leader also mentioned preferring this method in the Kent debate. Yet this will clearly still select the well-educated middle class children – because there are just so many of them! Whichever way you pick children for selective schools you end up giving the best schools to the advantaged families, and the worst schools to the disadvantaged. I honestly can’t see why anyone in the country would want a grammar school system. I think if there is demand it will be based on a belief from middle class parents that their child will claim a grammar school place. Yet if our large body of middle class parents all think their children will squeeze into 30% selective places plenty will end up disappointed. I don’t believe our education system is perfect, (and I do think Hitchens has a good point on ‘house price; admissions) but comprehensive education has improved significantly, and it works well in most nations throughout the world. “It’s academic selection or selection by wealth.” This is the either/or choice that Peter Hitchens talks about so often. I agree that house price admissions are causing problems, and they need fixing. The one positive of the current grammar debate is that catchment area problems are now being talked about. I hope that Theresa May’s speeches about the horrors of ‘house price selection’ might actually lead her to do something about the problem. But Peter Hitchen’s point ignores a whole stage of schooling that is vitally important. Why should we accept that primary school allocation is based on house price? I don’t want to ignore the needs of 5 year olds in poor families, they clearly deserve good schools too. The 5+ is no solution, so Peter has no answer and seems willing to just accept this. I’d like to see someone use computer modelling to try out various admission criteria based on parent’s choices and pupil data. I also think we could find areas to trial different admission policies. We certainly don’t need to accept that grammar schools are the only admission fix. In Bucks there are 12 grammar schools rated ‘Outstanding’ and 1 rated ‘Good’, so clearly having a child with a high IQ in this county assures a good school. Unfortunately any child that fails the 11-plus finds 10 schools rated ‘Requires Improvement’ or ‘Inadequate’, with 14 non-selective schools rated ‘Good.’ It’s a similar picture in Kent. We have simply switched ‘selection by wealth’ to ‘selection by IQ.’ Is this really what we want? Here are three fairer admission methods that might be worth looking at. I’d be interested in exploring the ballot plus catchment area method suggested by the Sutton Trust. Nothing quite like this has been tried before. It feels easy to dismiss ballot methods as being unpopular with parents, but there are a huge variety of ways to do this. This only works for secondary schools but I think area-wide fair banding tests like those used by Hackney or Tower Hamlets can create fair school admissions. These tests create a truly ‘comprehensive’ mix of pupils in each secondary school with pupils admitted in bands of each ability. We know there’s a link between ability and socio-economic status, so using tests to create all ability schools also creates schools that are socially mixed. A side effect may be that it allows schools to use setting more effectively. We have a government that wants to match pupil data to parental income. This opens up a whole new exciting range of possibilities for fair school admissions. Prioritising school admission for any child from a family on a low income could end ‘house price selection’ overnight. It would be a brave move to do it, but who could really argue with giving poor families good schools? Kent County Council created a commission to review social mobility in Kent grammar schools and its final report can be read here. The social divide in our secondary schools is clear: 33% of Kent secondary school children receive Pupil Premium (based on children who have been registered for Free School Meals at any point in the last six years) but while 27% of Pupil Premium children attend non-selective schools just 6% attend grammar schools. The commission quoted Michael Wilshaw, the chief inspector of Ofsted, who said, “Grammar schools are stuffed full of middle-class kids.” I feel his verdict is true, but as a middle class parent I think the two-tier school system causes problems for everybody. It creates a winnable competition for school places, and the side-effect is unintended harm to the poorest in society. It is natural for parents to want the best for their child, and Kent parents feel pressured to achieve a test pass for their child to win a place at a decent school. All Kent grammar schools are rated highly, with the vast majority rated Ofsted ‘Outstanding’ and unfortunately many high schools are rated ‘Requires Improvement’ or ‘Inadequate.’ So parents often use paid for tutors, and if that isn’t possible they will practise test papers on top of the regular school homework. No one likes this, but it works, and it has to be done to be certain of a good school. This means disadvantaged children are competing for the best school places with parents who put a lot of effort or money into securing a grammar school place. Poorer families obviously can’t afford tutors, and in many cases family circumstances mean children do not practise for the test. I am disappointed that the council commission failed to recognize the fact that coaching is commonplace and works. I am also surprised that they did not review the test process to make this fairer for disadvantaged children. Many of Kent’s disadvantaged children attend under-performing schools with poor English and Maths results, and they cannot hope to succeed if our eleven-plus test judges attainment in English and Maths. Successful primary education leads to successful test results, leads to a great secondary school, leads to university… A troubled primary school leads to a Kent Test fail, leads to an under-performing secondary school, leads to worse career opportunities… This is the Kent social divide in a nutshell. I do not feel any of the council’s recommendations will fix this. I helped the Kent Education Network (KEN) prepare a report for the commission which offered many ideas to improve social mobility, but these were ignored by the commission. The council suggested they were powerless and could only make weak recommendations as most schools are academies (10 of Kent’s grammar schools are actually council maintained) but crucially I feel they should have acted to improve the Kent Test. Improving the test process is entirely in their control. Here are some ideas for a fairer Kent Test. Remove attainment aspects of the test which discriminate against children who attend poor quality primary schools. There is evidence that children attending primary schools with poor English and Maths results have less chance of passing the Kent Test. It is clearly not a child’s fault that they attend a troubled school that does not give them the skills they need to pass the English and Maths papers in the eleven-plus. Two thirds of the Kent Test score is based on attainment in English and Maths, but this must perpetuate educational disadvantage for children who attend a troubled school. End the Head Teacher Assesment (HTA) process. 28% of Kent children attend grammar schools but just 21% of grammar school children have passed the eleven-plus test. 7% fail the Kent Test but are re-assessed as ‘grammar school ability’ by a Head Teacher Assesment (HTA) panel before the test scores reach parents. The fact that 7% of grammar school pupils actually failed the Kent Test should give reason to question the test’s accuracy. 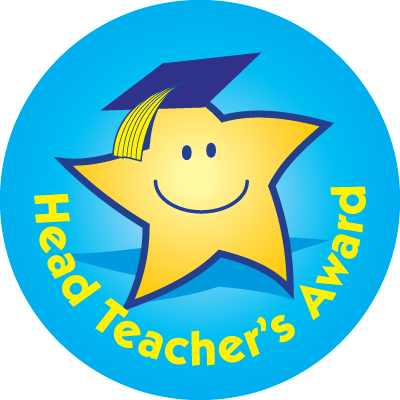 The HTA system would be fair if all heads used it equally, but it is clear that some heads seek to have many of their children re-assessed from a fail to a pass, while other heads do not choose to use the HTA process at all. The HTA panel also offers little transparency, but a FOI request showed one school submitting 15 “fail” children for reassessment with 13 becoming “suitable for grammar school,” while the majority of schools submitted just 1 or 2, and some didn’t bother at all. Last year around 2,000 children with “fail” results were reconsidered by HTA, with 1,000 then awarded a ‘suitable for grammar school’ assessment. This second chance of a pass can be used by schools who hope to boost eleven-plus pass rates, while other schools ignore it completely. It is not a fair process if a child’s chance of reassessment depends on which primary school they attend. It is also possible that unconscious bias might lead heads to recommend middle class children to the panel. I think the commission should have presented numbers for Pupil Premium children re-assessed by HTA, if only to track if more disadvantaged children are entered in future years. A Kent grammar school pass uses an overall pass score based on 3 papers (320 was the pass mark last year) but a child will not pass the test if their result in any single paper is below a minimum score (this was 106 last year.) The maximum available score is 420 points. So any child who is a Maths genius might gain a score of 385 (way above the 320 pass mark) but still be judged ‘suitable for high school’ if they were bad at English and got a score of 105 in that paper. The council publish results data on their website, and we can see some children with scores as high as 379 judged ‘high school ability’ while children with scores as low as 297 are judged ‘grammar school ability’ due to HTA re-assessment. I might support the HTA process if this could help my hypothetical maths genius – but a head once told me that children with messy writing are often dismissed by the panel when they look at exercise books. So in Kent this not-very-scientific eleven-plus approach appears to define ‘suitable for grammar school’ as a child who is a good academic all-rounder with neat handwriting! Our grammar schools would be unlikely to accept an amazing poet with average maths ability, or a maths wizard with poor spelling skills; and if any young poet is left handed with messy writing they should write an ode to life at a secondary modern. KEN made a couple more points, which were bound to be ignored, but I think they were worth mentioning. What are the benefits of two-tier education system when there is a national curriculum? It’s funny how academic selection has changed from a system which attempted to benefit all children by offering a curriculum suited to their needs, to one that now offers no conceivable benefit to any child who fails the eleven-plus test. KEN asked KCC for a clear statement on the purpose of high school education. I don’t believe our council actually has one. A test fail means ‘grammar school education lite’ it’s just the same curriculum, the same goals, but with plenty more chance of a bad school. I don’t know anyone who thinks we should bring back a different curriculum, but no one asks the 72% who fail the Kent Test whether they like a second tier of schools and being banned from schools offering the same exams with less need for supply teachers. There’s also the thing that the eleven-plus existed in an age before government testing. We now define primary school children as ‘high ability’ via SATs, do we even need an eleven plus? Clearly there is no science to picking September 8th of year 6 as the best date to judge children’s intelligence, but we are defining children here for admin reasons, why not use SATs? Interestingly this could cause problems as SATs scores show 20% of grammar school children are only ‘medium ability’. Which test is right, and yet again, where’s the science to all this? Will someone just admit that coaching works – please!!! I understand that the council can’t admit that Kent Test scores can be influenced by a paid for tutor, but the commissions talk of giving disadvantaged children “enrichment activities” involving English and Maths, at the same time as having a flat out ban on coaching in Kent schools is bizarre. If anyone can explain the difference between “enrichment” and coaching I’d love to know what it means. Admitting a problem is a good first step to fixing it, and if coaching and/or “enrichment” works then all Kent school children should get this in school. I do give Kent County Council credit for admitting there’s a problem with social mobility in our schools. I hope this ends the idea that grammar schools save the ‘bright poor.’ Maybe they did that, once upon a time, in a world before Google showed primary school eleven-plus pass rates, in a time before tutors ads dominated eleven-plus forums. Kent County Council council looked at social mobility in our grammar schools, but what about social mobility in Kent high schools? There are around 2000 disadvantaged children in Kent grammar schools while there are 23,000 disadvantaged children in Kent high schools. How does divided education effect their social mobility? The chair of the KCC commission mentioned that social mobility might also involve someone who, “takes a vocational course at college and goes on to create a successful plumbing business employing staff. ” I guess this is the secondary modern ideal, but it ignores the fact that 17,000 children in Kent high schools are rated ‘high ability’ based on SATs scores. So not only do I want to see stats on successful plumbing businesses, I want to see stats on university success from Kent’s forgotten high schools. The commission concentrated on grammar schools, but ignored the fact only 30% of Kent’s disadvantaged children achieve 5 GCSEs, compared to 37% nationally. In the rest of the country this figure is improving, in Kent it’s got worse three years in a row. I don’t think social mobility is a grammar school problem, I think it’s a two-tier education problem. I hope a new council commission will look at social mobility in Kent high schools. I expect they won’t do this, because it will show disadvantaged children have worse outcomes here than in other counties. The fact our council is concerned about high ability children is a Kent thing; our system is set up to care about the brightest and best, but I think we should value a child aiming for 5 GCSEs just as much. I am impressed with the new members at Canterbury City Council, although I am biased as my husband is one of the councillors! I blogged recently about their plan to seek money making ideas from the community in the ‘Ideas Lab.’ This seems like a clever way to get the public on board, with members of the community working with the council in a shared aim to raise cash for our district. In general the new council seem keen to inform the public early, and involve them in consultations. A clue to this change was the announcement of car park and transport plans in a meeting for community groups. This was clearly an attempt to tell the people who matter first. Feedback on this plan is now being sought, and is one of many consultations underway. There’s a public meeting in Whitstable on Friday 22nd at 7pm at the Umbrella Centre if you want to find out more, you’ll find the details here. The consultation that interests me most is the proposal for the 2016-2020 Corporate Plan. This document sets out the aims and priorities for the council’s term in office. The temptation is to say, all very good, and leave the council to get on with things… Only I’m not going to leave them to get on with things! We’re being asked for an opinion, and this is important stuff. It feels like an opportunity to get involved and push our council to work a little harder. I think they’re doing a good job, but a consultation is an opportunity to influence them to do a great job. I’ll be honest. I think the council has a trust problem. Many of my friends are suspicious of local government, which is odd when you see what they’re about listed in 10 super-positive aims and objectives. Everyone would agree these things are worthwhile and important. Only somewhere in the detail, or the delivery, something goes wrong and people become suspicious, or in some cases even angry. This is a consultation on a four year plan with broad aims that look rather nice. So I suspect the council are not going to get a lot of comments or suggestions… The consultation involves a survey with comments. We can say on a 5 point scale whether we strongly agree with this point, are somewhere in the middle, or strongly disagree. It would be an odd person to check the strongly disagree box! But perhaps this exercise will be useful to councillors, and lead to some feedback on what matters most to people in the district? There are boxes on each point for comments, but I’d imagine if you cared about any issue in particular and had a lot to say it might be better to write to a councillor or council department. This exercise even has some potential to lead to lack of trust again. There’s nothing worse than someone saying, “What do you think of this?” And you tell them and they ignore you. Of course the council can’t act on anyone’s whim, but what if we see the results published and 70% of people think ‘Inspiring people through a wide range of cultural activities and opportunities’ is not very important..? Will those comments and points really be heeded and plans changed? I think the council is better for public involvement. But (massive BUT) this only works if there is a genuine desire to act on those comments. I’m going to write a consultation comment about the council consultation strategy..! That’s all a bit meta, isn’t it!? But I am worried that this consultation does not live up to the high aims of points a) and b). I agree with ‘consulting where consultations can make a difference’ but I think this point has a danger of shutting down communication. I would say that communicating information is important even when the public can’t have a say. An analogy used in a recent Facebook discussion was about neighbours extending a house. If the neighbours chat about the builders work they may find a compromise to make a difficult situation work better (consultation.) The other side to this is that simply knocking on the door and saying ‘this building work is happening’ (no consultation, just good information) can also make things run smoothly. So I would suggest that consultation and sharing knowledge are both parts of a good relationship between public and council. I think good communication matters and should be somewhere in this document too. I am trying to work out the thinking behind this consultation principle. I want the council to seek comments because they feel decisions can sometime be better with public involvement, but it is clear that they are seeking comments because their decisions are better when they are informed by the public. It’s a subtle difference, but it effects the strategy. It supports a one-sided approach of choosing cases where they may listen to the public and choose to be guided by them. It doesn’t encourage any public involvement to guide the council. They are listening not discussing. So I guess that is why there is no mention of communication… It is not a very new strategy to do it this way. Consultation may be number 1 on the list but this is an average sort of consultation policy. But then again, I wonder with things like Ideas Test and those public meetings, do these things suggest they may want a little more that this? Principle 2 We will encourage local individuals and communities to become self-reliant and actively engaged in improving facilities, activities and the environment. I think a council who wished to communicate and engage with the public might find good ways to connect to people and groups who want to make a difference. I think a smart council might even lay some foundations for doing that. I liked this post about this here. I think there may be people in our communities with the skills who might help with all sorts of council things from community centres to rubbish problems, and I think the council must have many services they need help with. So how do they put the two things together? I think there could be some innovative ways, all tied in with good communication and telling people what is needed. I assume they are not considering the consultation and working together bit here because they’re seen as minority interest. I think the council are missing a trick. They are saying ‘cultural activities and opportunities’ can inspire people. They are probably spending wodges of budget on this inspiration..! But I would argue that community involvement and engagement with neighbourhood improvements can inspire people too. Only this doesn’t cost anything, and it can save the council money. I get a kick out of going to the Beaney and learning about history. I get a kick out of thinking of ideas too, and being listened to when I’m having a say on things that matter, and I love learning about improvements to our town like new sports centres and changes at the harbour… It’s not Beaney history, but it’s another sort of learning and inspiration. I think people can often be inspired by communication of neat improvements to our town, and I think people can also be inspired by opportunities to take pride in their community and get involved in improving it. I found one council who had this line on their corporate plan. Create a well connected and engaged city. The measurement points included, opportunities to have a say, community engagement/volunteering, numbers participating in consultation activities, civic engagement in decision making. I liked this. So I would put something like this in my council wishlist. I also took part in a central government consultation recently and looked at the policy document about the principles of the consultation process. The consultation I took part in involved a new law I disagreed with. But the thing is, I was told very clearly that this thing had been decided already. I was told that the consultation was only on two small bits of the implementation process. I worked my hardest to make these two things as good as they could be. Strangely I wasn’t angry, I understood the big law wasn’t my decision to make, but I could influence this situation I cared about. I only had a say on one very narrow thing, but this tiny aspect was something I thought I could change. I think this was an excellent consultation, because I felt empowered by commenting on the one thing that I could certainly influence. This felt much better that writing lots and lots of points about something I had no clear hope of doing anything about. I’m afraid this corporate plan consultation is not very guided. I don’t know what I can influence, I have my doubts that anyone can influence anything. The point above says ‘we will consult only where there is a genuine opportunity to influence the decision.’ But it doesn’t tell me which bits are open to negotiation here, or how we might change things in the corporate plan, or in what sort of way. It is not a bad consultation, but it’s certainly not a consultation that asks a very clear question. When the central government consultation asked a question I felt ‘needed’, they were not asking people for the sake of it, they told us exactly what we could do and I trusted I would be heard. Also I somehow need to turn this blog post into something to actually submit! The council should commit to a clear plan for communication, and it should be early and honest communication. Communities want to be engaged, so the council should seek ways to get people involved and tell them very specifically what is needed. The council should learn from the best, steal the central government style of narrow consultation rather than a free for all. That also means giving people clear power to actually influence decisions, even if it is only in very small ways. Central government also give the right amount of information. Not many people read a long document or presentation, but a recent Education Select Comittee gave 3 bullet points of information, one question, and a web forum. That is a very public friendly consultation. I feel the council do not properly use a resource of a bunch of people who passionately care about their community. They should consider the benefits of actively engaging them, look at places that do it well, and consider measuring themselves against a high benchmark of being the best council for a positive relationship with the public. People like this stuff as much as they like the Beaney! I worry that Canterbury district resident’s care for our community often manifests itself in hours of free time spent in protest about council things that have gone wrong. This involves people debating controversial issues with friends, getting petitions together, sharing social media news, or writing to the papers. The subtext to this is not only that the people care, but that they give free time willingly to these issues they care about. Can’t we find a way to harness exactly that same motivation, and these hours of our community’s hobby-time in a more positive and productive way? People want to make a difference, we give them no way to make a difference, and their time is spent feeling frustrated and patching up the perceived problems. I’ve written an awful lot on just a couple of presentation slide points. There you go, I’m yet another care-about-my-community type, wanting to do something and not sure if I’m usefully engaged..!.We’re a free resource and we like to help, maybe one day the council will accept brain power and caring alongside the council tax payments. The corporate plan consultation runs until Friday January 22nd at 5pm, check it out, check those boxes and have your say here.